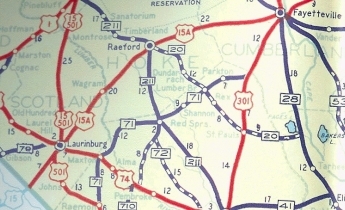 The Road: Begins at the South Carolina below Laurinburg (Scotland County) and ends at I-85/US 1 above Wise (Warren County). 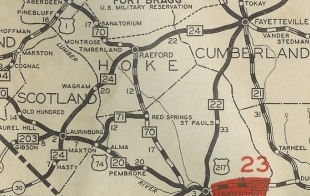 Nationally the route runs from Wise to Sumter, SC. 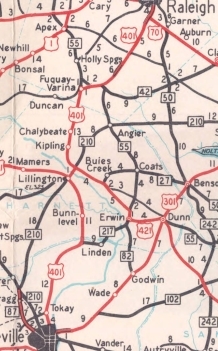 History: US 401 appeared in 1957 as an addition to US 15 from the South Carolina line to Laurinburg, then replaced US 15-A to Raleigh, then replaced NC 59 to its endpoint of US 1-158 in Norlina. This is the third US 401 nationally. 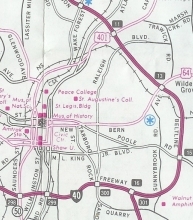 In March 1967 (NCDOT), US 401's NB split in Raleigh was changed to use South St west to McDowell north instead of using Lenoir St. 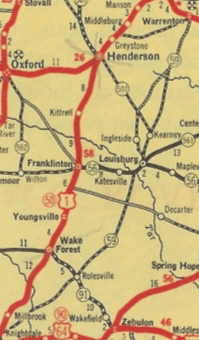 In Nov 1967 (NCDOT), US 401 was placed on its Fayetteville bypass, replacing part of NC 59. 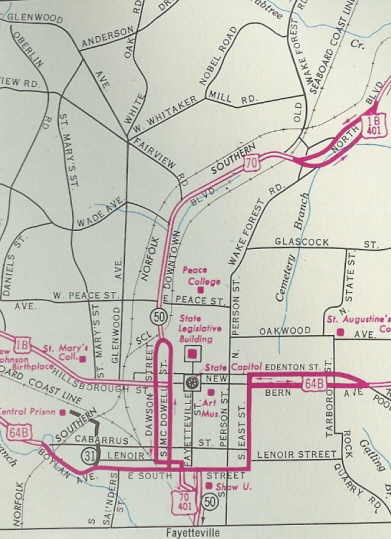 The old route through Fayetteville became US 401 Business (some of Russell St and Robeson St have been removed as primary routing since). 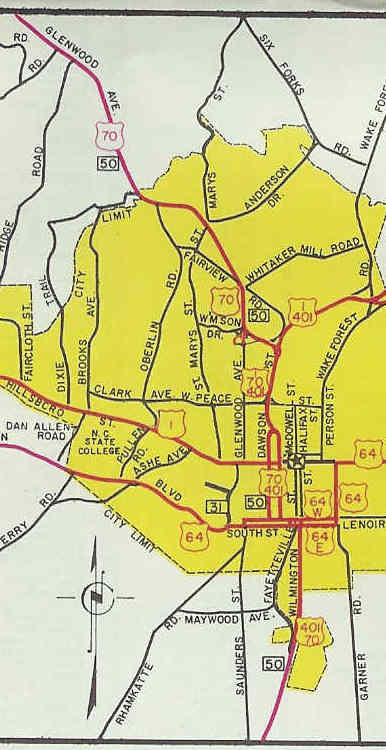 In 1983 or 1984, US 401 was placed on the Raleigh Beltline around the east of Raleigh. 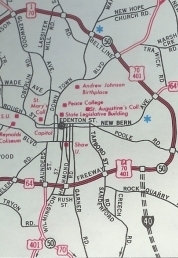 In July 1991 (NCDOT), US 401 was removed from the Raleigh Beltline and put back through Downtown Raleigh as it runs today. 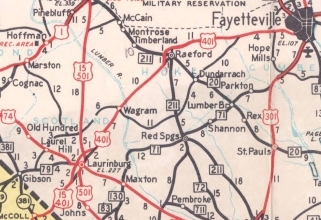 In 1994, US 401 was removed from Raeford Rd at Lake Rim west of Fayetteville. 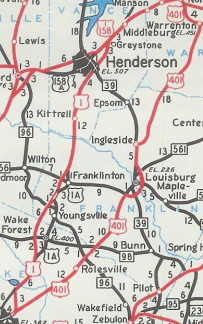 In June 2001 (NCDOT), US 401 was extended north with US 1 to end at I-85 just short of the Virginia line. 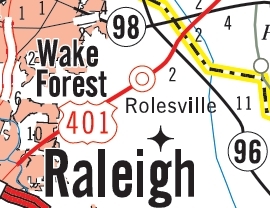 In July 2015 (TM post), US 401 was placed on a newly constructed bypass around the east of Rolesville, leaving behind US 401 Business. 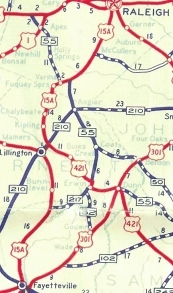 The second national US 401 was born in 1932, running from Raleigh south via Fayetteville and Lauringburg into South Carolina heading for Sumter, SC and ultimately Walterboro. 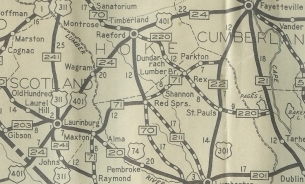 This was an addition to NC 21 from Raleigh to Fayetteville and NC 24 from Fayetteville to South Carolina. 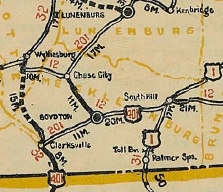 In late 1934, US 401 was renumbered as US 15 from SC to Laurinburg and US 15-A from Lauringburg to Raleigh. Comments: US 401 seems like one US route number too many to me. I don't understand why this hasn't always been US 15 or US 501. 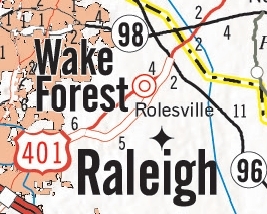 North of Raleigh it is simply a slower-paced alternative to US 1.